A wonderful down-home recipe that will have a delicious dinner on the table in a hurry! 1. Stir the soup, milk, paprika, red pepper, tuna, cheese and rice in a 9-inch square baking dish; cover with aluminum foil. 2. Bake at 350 degrees F. for 30 minutes; uncover and stir. 3. 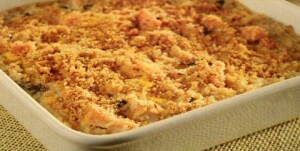 In a small bowl, combine the bread crumbs and melted butter; sprinkle over the tuna mixture. Bake 20 minutes longer or until hot and bubbly and the rice is tender. Makes 4 servings. * If your family is not partial to tuna, you can substitute an equal amount of canned chicken for the tuna. Hi Emily, I haven’t used my coupons for the chicken yet. I was just wondering if they are dated. I better check. Love this recipe. It sounds delicious and I have all the ingredients. That is the most appealing part. HA!